source: 1950s "Bumps & Falls News"
Roberta Molaro (who skated in the namesake rink) wrote: "I don't recall ever seeing dance notes ... basically, we just learned it from each other. Every step is 2 beats. We'd chant: "He turns, She turns, we both turn" for the straight-away steps." She added that it was skated to a 100 Boogie. She adds, "However, what is seen today doesn't resemble the original! ... My thought is that during WWII Mineola boys stationed in the Brooklyn Navy Yard, Mitchel AF Base and other nearby places, brought their buddies from PA and across the country to introduce them to our rink. Local girls taught these fellows this dance. ... Then they brought what they remembered of the dance home with them. Of course they only learned the man's part, so they came up with the many versions that are seen today. ... Essentially, it was a "Lindy Hop" on skates. Even the Lindy was subject to personalization, right? 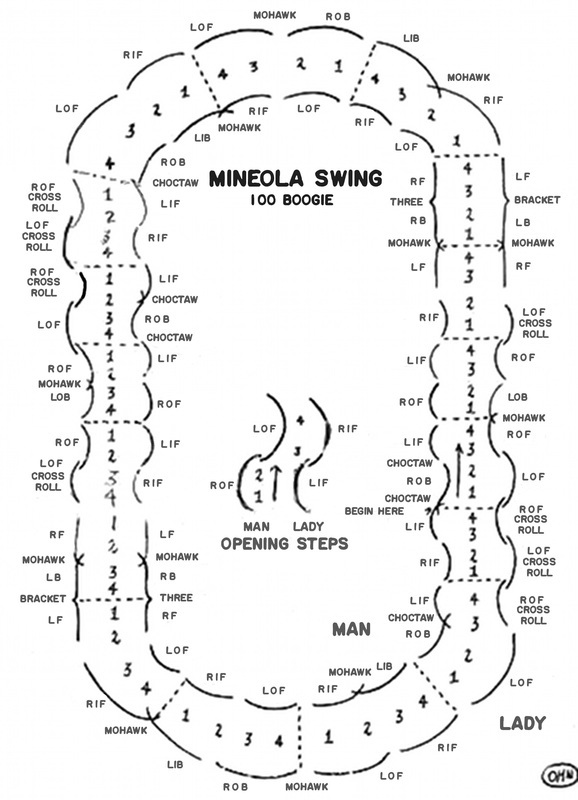 .... What's important, is that wherever the dance is being done, Mineola Skating Rink is being remembered, in spite of being gone for nearly 60 years!!!!" 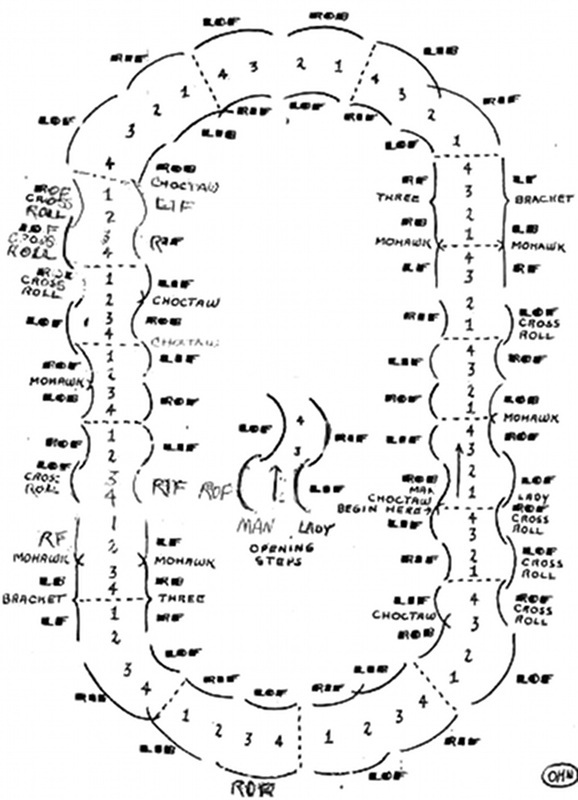 I've only come across one written diagram, and various generations of copies. Mrs. Molaro has verified that the 'cleaned up' text is correct, and was published in a 1950s "Bumps & Falls News". Original diagram with text 'cleaned up'.